We offer 24 hour towing by professionals who use only wheel-lift or roll back wreckers to ensure the integrity of your vehicle. Whether you have run out of gas, slid into a ditch, or had a minor fender bender, you can depend on us to get you back on the road as quickly as possible. If you do, by chance, get into a situation where you cannot use our wreckers, how do you choose the right one? First, ask questions-is it a wheel-lift or roll back, are you local, how much will it cost, are there extra fees for certain mileage. 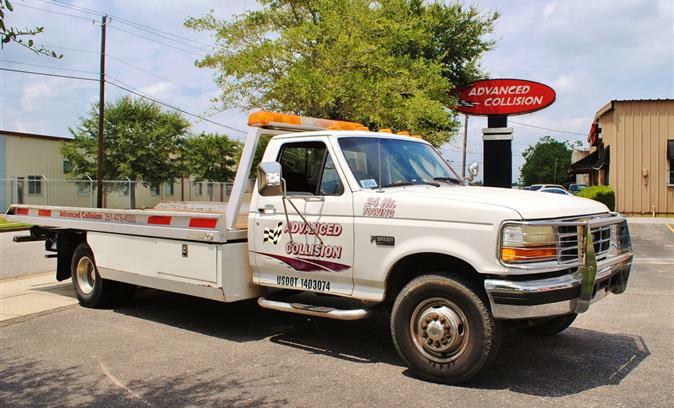 If you use our towing company for collision needs, you will not have to pay up front. We will include the tow bill on the estimate to repair. If using another towing company, make sure they put the cost on the invoice before you sign the wrecker slip.